In my latest column for the Economy Lab feature of the Globe and Mail, I take issue with the journalists who think the only issue that matters with internal barriers to trade is the price tag we assign to them. The fact that any attempt to quantify their cost is subject to challenge becomes the story, whereas in reality it is a disingenuous distraction much beloved by apologists for the status quo (cf Baloney Meter!). We know four things for sure about internal trade barriers: they’re real, they cost us a lot, their damaging effects compound over time, and they violate our rights as Canadians. Isn’t that damning enough? If you want chapter and verse about the problem and the solutions, see the MLI paper I co-wrote with John Robson and Bob Knox, Citizen of One, Citizen of the Whole. “For next steps, many conservatives are turning to Fearful Symmetry: The Fall and Rise of Canadaâ€™s Founding Values, a new book by Brian Lee Crowley, an economist and founder of the new Macdonald â€“ Laurier Institute. Crowley does not regard himself as a social conservative. But many who do see themselves that way like what heâ€™s saying. To caricature a complex argument, Crowley says the modern welfare state has overextended itself, is unsustainable, and causes more harm than good to institutions like the family. These trends will only get worse when an aging population sharply increases the cost of delivering most social programs. One size can no longer fit all. Social services will have to be narrowly aimed at those who need them most, and delivered only as long as recipients are willing to improve their behaviour by attending to their family, keeping or seeking a job, and so on. Crowleyâ€™s book was published last autumn. It seems to have been barely one step ahead of the news. This monthâ€™s Throne Speech contained a single line saying the government â€œwill look to innovative charities and forward-thinking private-sector companies to partner on new approaches to many social challenges.â€ Such charities and companies were much in evidence at the Manning Centre conference. The changes Crowley anticipates are expected and embraced by social conservatives. Meanwhile, the federal Liberals are still defending policies from five years ago, policies Harper has taken pains to ensure future federal governments wonâ€™t be able to afford, with his GST cuts and his massive cash transfers to the provinces. If the Liberals cannot begin to make a case for a return to larger, more activist â€” and more expensive â€” state-run social welfare, then Stephen Harperâ€™s social conservative revolution will only accelerate. In all the blather surrounding Red Ed Clark’s call for higher taxes, and the federal Tories response, most of the attention has been focused on either the issue of whether wealthy bankers should be volunteering other people to pay higher taxes OR whether the PM should be criticising private citizens for voicing their opinions about such matters. Interesting as those questions are, they are not the most important matter. What really matters is whether raising taxes is the right way to fix the deficit. On this, history and human nature respond with a resounding “No”. History first: the last time we wrestled successfully with the deficit, under Paul Martin’s stewardship at Finance, we did so chiefly by reducing the size of government. The most startling measure of our success: We went from spending a historic high of 53% of GDP on government in 1993 to roughly 40% in 2008, an unprecedented decline in our history. We were able to do so, by the way, while increasing spending on programmes AND cutting taxes because our fiscal discipline allowed us to stop spending so much on interest on our debt. 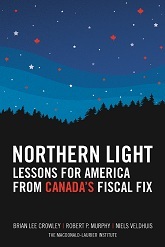 And we ushered in an era of strong economic growth: we outperformed all the other G7 nations for over a decade after Paul Martin tabled the first balanced budget in the late nineties. Remember that all other attempts to deal with the budget, including the gig tax reform that led to the creation of the GST, did not bring the budget into balance. It was *only* when we got our *spending* under control that that happened. And that brings us to the human nature side of the equation. The fact of the matter is that politicians are human beings and subject to many pressures and incentives. When a dollar gets in their hands, it does not come with an endorsement saying “May only be used to reduce the deficit”. Instead it becomes the prize in a tug of war between various interests all wanting to get something out of government. Many and perhaps most politicians regard a dollar in the consolidated revenue fund as a reason to spend that dollar on their favourite programme. The reality is that if we want to balance the budget, the strategy that has proven itself without a doubt is to control spending. Raising taxes too often just gives politicians comfort that they can continue in the bad old habits. And it is those habits that have to be broken.